CEU Info: The Centre for Expressive Therapy is accredited both by the Association for Play Therapy Provider number (#95-010) and the Canadian Association for Child and Play Therapy, Provider number (#09-102) to offer continuing education specific to play therapy. 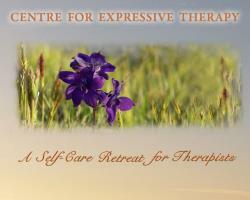 "A Self-Care Retreat For Therapists" is intended for adult and/or child therapists. During these three days, we will focus on the issue of self-care, the need for ongoing self renewal, that is essential for us to maintain the stamina necessary to provide our clients with a safe place to heal.